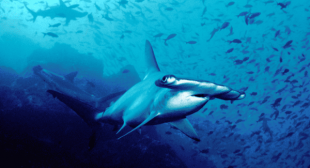 A group of Ecuadorean scientists has discovered a hammerhead shark nursery where they have been born and sheltered for nearly a million years on the Galapagos Islands, the remote archipelago tucked away 1,000 kilometers off South America’s Pacific coast. “It was quite by chance that we found this natural nursery for baby hammerheads, a species that is under a high level of threat,” Eduardo Espinoza, the biologist in charge of monitoring ecosystems in the Galapagos Marine Reserve, told AFP. “The females arrive to give birth and then leave. The young have all the food they need here and the reefs afford protection from large predators,” he added. The hammerhead sharks grow as long as three meters and live for up to 50 years. After a year or two, when they are grown and are in need of more food, they travel, sometimes for thousands of kilometers. For several years now, park rangers in the region have been monitoring and tagging hundreds of sharks at the marine reserve, which was named as a Natural Heritage site. In 2016, the government of Ecuador added extra protections for the species’ preservation by creating a 38,000-square-kilometer sanctuary zone between Darwin and Wolf islands, where all fishing is banned.